I love this time of year! 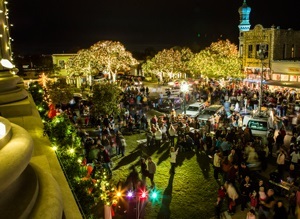 If you are thinking about making a move to Georgetown, Texas come and experience this holiday tradition. On November 25, come experience the magic as we kick-off the holiday season with the annual Lighting of the Square, traditionally held at 5:30 p.m. the Friday after Thanksgiving! Sing along with the Austin Carolers to your favorite holiday tunes and warm your tummy with cookies and hot chocolate! Join Georgetown Mayor Dale Ross and Williamson County Judge Dan A. Gattis as we help Santa countdown and flip on the holiday lights on The Most Beautiful Town Square in Texas! The downtown shops will be open late, so plan to get in some unique holiday shopping. This is a free event. The Williamson Museum will be hosting a free craft activity from 6 – 8 p.m.! You can have your photo taken with Santa inside the courthouse from 6:30 – 8 p.m. (photo fee proceeds benefit Brown Santa Program). For questions, please call (800) 436-8696 or email cvb@georgetown.org.